The restoration of a Land Rover is the culmination of a dream for many of our clients. We take the process and our clients’ wishes very seriously. East Coast Rover owners know that once rust begins, that is the time to take action. The first step is to bring the vehicle to The 4×4 Center facility in South Burlington, Vermont. We will spend three to four hours performing a thorough inspection, after which we will have a frank discussion with the customer about their vision for the vehicle. Based on this information we will provide a preliminary estimate of what it will cost to achieve the goal. Do you live out of state? Many of our Land Rover Restorations come from the North East and East Coast however, we've restored vehicles for customers from all over the world. Contact us to discuss how we make these projects possible. Once we’ve agreed upon a direction, The 4×4 Center will create a detailed outline of the project, including a computerized cost estimate and a line-by-line breakdown of what we propose to do. At this point, we will have another in depth conversation with the customer, and make revisions to the plan based on customer comments. Sometimes a customer’s budget does not allow for a full project completion all at once, in which case we will work to prioritize a list of upgrades to tackle over time. We understand that not everyone has a bottomless bank account, and we work hard to find solutions that meet budgets as well as fulfill wishes. When the line-by-line plan is finalized and approved, we get busy. During the restoration process we stay in constant contact with the customer, emailing up to date billing information and stage-by-stage photos of the project so you can see in real time how the vehicle is taking shape. At any time during the process when you call us, we either pick up the phone or we call you right back. The last step, of course, is to put the keys in your hands, your foot on the gas, and a smile on your face. See some of the work we have done in our past vehicle restoration projects. 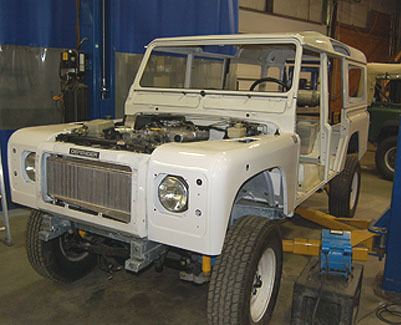 The 4x4 Center specializes in East Coast Land Rover Restoration and North East Land Rover Repair. Questions? We have answers. Get in touch today.